We were delighted to pick up two awards at the Building Better Healthcare Awards last month. We were proud as punch to be Highly Commended for our work with Ptolemy Mann, Kate Bond and O’Leary Goss architects in redesigning the Sanctuary and Bereavement Suite for University Hospitals Bristol NHS Trust. Ptolemy’s textile screens are both stunning and functional, they act as practical room dividers creating a multi-use shared sanctuary. 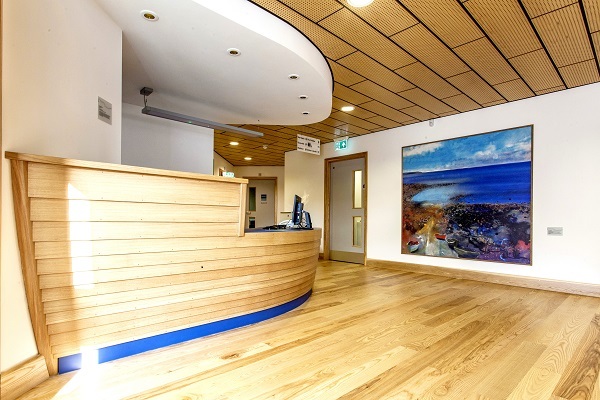 Willis Newson was announced as winner of the Patients’ Choice Award for the arts programme we delivered for the Cove Macmillan Support Centre, Cornwall with ADP architects, Macmillan Cancer Support and Truro Hospitals NHS Trust. Thanks to our associate Bronwen Gwillim who curated, managed and nurtured both projects into being.